We are seeing an increase in consideration and spend in favour of DOOH over static OOH formats. 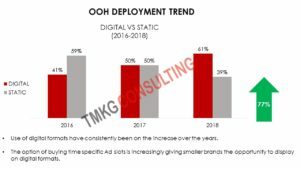 The use of digital formats although at a higher cost creates greater flexibility in campaign deployment, opportunities for more targeted advertising and opportunities for integration of ATL communication with sales promotions and experiential activations. Until these opportunities are harnessed into competitive advantage by brands, the debate on the justification on the cost and use of DOOH will persist.